Win a game at 1 life. Win a game that lasted at least 7 turns, without receiving any damage. Win a game by having 40 or more life. Win a game by depleting your opponent's deck. Win a game after playing at least one card from each aspect. Reach a rating of 1250 or more points. 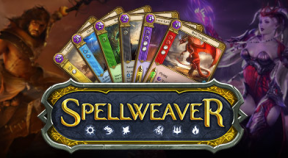 Reach 10 Wins in a Spellweaver Trial. Win 7 Friendly or Ranked games in a row. Unlock all quest points on the World Map. Collect one copy of each Order card from Valiant Dawn. Collect one copy of each Wisdom card from Valiant Dawn. Collect one copy of each Nature card from Valiant Dawn. Collect one copy of each Rage card from Valiant Dawn. Collect one copy of each Dominion card from Valiant Dawn. Collect one copy of each Corruption card from Valiant Dawn.